This was the plan: Cook dessert for Nancy's Palm Sunday dinner. For some time we've both wondered about a recipe for Krispy Kreme Bread pudding that I spotted last year in Food & Wine. 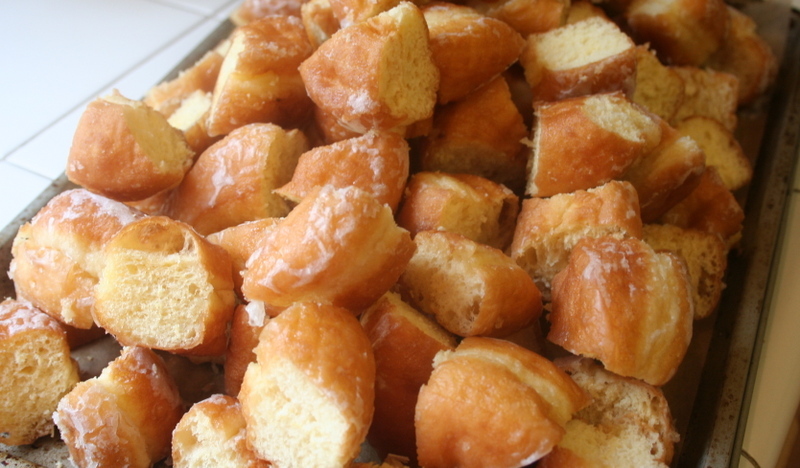 Yes, it's a doughnut bread pudding, but not the Paula Deen version. Her version contains fruit cocktail, and is rather famous. As a child, I once watched another kid vomit up a large quantity of Libby's Fruit Cocktail. The sight was seared into my brain and I've never been able to eat that stuff again. This Food & Wine recipe contains no fruit cocktail, just tons of cream and eggs. As if the bread pudding wasn't already decadent, a sauce of lightly wipped cream mixed with expresso is poured over each serving. Insanity prevailed and I decided to make it. It seemed like a fun thing to do. What follows is clearly the efforts of the Food Rehab part of my brain doing it's best to completely sabatoge my efforts at making this dish. And it worked. It was a disaster.